I bet my Dads the best fighter on the forum. so there ! Hmmm ? I wonder if they do a Zimmer version ? The picture you have posted is very alike the one I found, in a smaller size. What did you find out about your buckle ?. The buckle was found in an area that is full of early Medieval History stemming from William the Lion, however there is also a lot of alleged Viking activity that had taken place as well of which there was supposed to have been temporary settlements. Looking at the Bronze Buckle it does have possible Serpent or Dragon heads on it so may point in that direction of perhaps Viking as opposed to a specific Medieval time? But yet again there is one other possibility that cannot be ruled out as well and that is maybe of Anglo Saxon origins as well for conceivably these sorts of buckles could have been dropped by Vikings that had raided parts of England? But I would go along with Viking or Anglo Saxon! Can i be the token Whites person???!! Last Sundays Dig Was a " Dig Off". 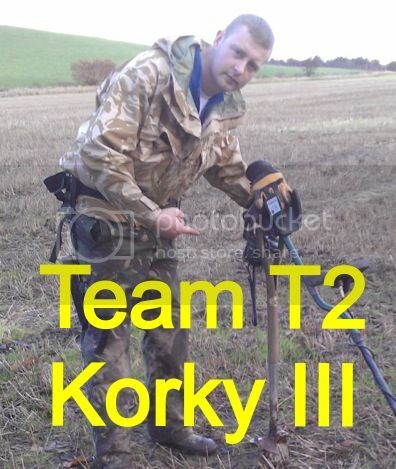 Minelab Vs T2, Two Minelabs Against Two T2's , And The Results Are In !! LOL. If Mineslab boys want to see the finds coming out of the ground, they would HAVE to be close to a T2 user !! I witnessed with my own eyes, a certain t2 user actually winding it up , I kid you not , Eh Rob? He slackened the stem nut and was winding it up , i though i`ve never seen the likes, myself & Rob bore witness to the actual event , WOW then out to the field and done some kinda ritual almost like a bicycle pump , up `n` doon repeatedly , how very strange as i switched on the auld Minelab and picked up a farthing ,wierd , but hey ho,there ye go . lmao aye thats right was a strange ritual to witness the whole winding it up and pumping the ground thing o_O, Scotty I wonder if it's some strange ritual??? or just what you have to do to make it work?? maybe Shug can enlighten us?? ?